The Bay of Islands in the north of the North Island of New Zealand has some of the most amazing scenery, not only in NZ, but of anywhere in the world. The dozens of islands boast blue water around and reefs that drop away steeply from the shore. In the northern section of the Bay of Islands there is a brilliant dive site that can be done as a second dive after the Rainbow Warrior. It is at least an hour by very fast boat from Russell and Pahia. We came from Te Uenga Bay boat ramp. To the north-east and east of the wreck are some islands. 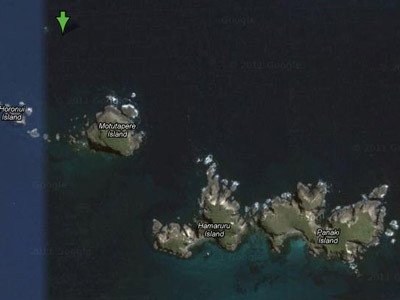 One of these is called Motutapere Island. About 700 metres to the north-west of the island is a small bombora (a reef that is sometimes above water). 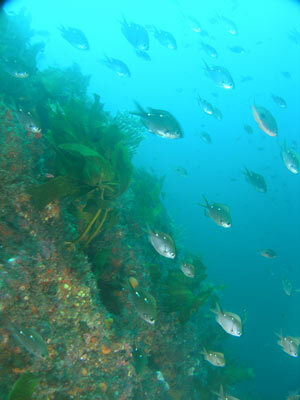 To the east of this reef are a series of two pinnacles that come up from 36 metres to about 10 to 12 metres. Anchoring at GPS S34° 58' 00.5" W173° 56' 14.7" (using WGS84 as a datum) will put you on the second of the two pinnacles, that is, the one furtherest to the east. This pinnacle is probably the best one to anchor on as it will keep you free of the bommie in easterly or south-easterly winds. Once on the pinnacle, you will see that the pinnacle is covered in kelp. It drops away very steeply, in some spots vertically. Head in a counter-clockwise direction (that is with the reef on your left). You will start to head north and then to the west. Once you are heading south, you should be able to see across to the first pinnacle. It is roughly west to cross over. It is about 10 metres between the two pinnacles on the sand and about 15 to 20 metres at about a depth of 20 metres. After crossing to the first pinnacle, head again in an anti-clockwise direction. These pinnacles are not huge, perhaps at 20 metres they have a diameter of perhaps 30 or 40 metres. Head north and then west. The pinnacles have a lot of kelp, but there are also some small gorgonias and sponges. Once you are heading south again, you should be able to see the main bommie. Cross over again (it is a similar distance as between the two pinnacles). The reef here is almost vertical, dropping straight done from perhaps five metres to the sand at 36 metres. There is a lot of fishlife in this area, blue maomao, two spot demoiselles, kingfish and large snapper. A short distance around from where you meet the bommie there is a large cave at that has its top in 23 metres. 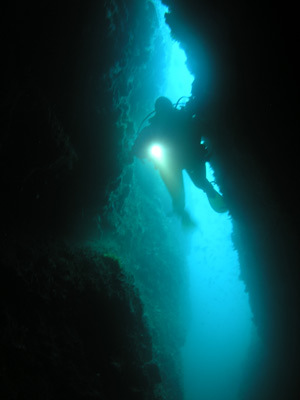 This cave runs back into the bommie and is about 20 metres long, two to three metres wide and quite high. You will need to be about 25 metres at least to enter it. From here, continue in an anti-clockwise direction. The south-eastern and eastern sides of the bommie have a huge amount of fishlife, as much as you will see anywhere in the tropics. 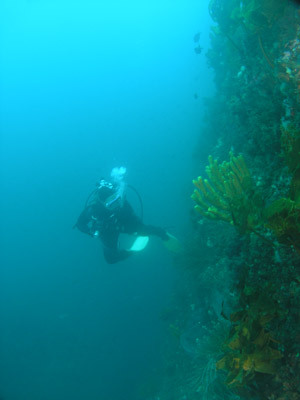 The northern side of the bommie (which you soon come to) has a shear vertical wall but further around, the western side has reef that slopes down less vertically as does the southern side. It takes about 25 minutes or so to get back to the pinnacles. Cross back over to the second pinnacle and then over to the first pinnacle. Spend the rest of your time gradually ascending till you reach the top of the first pinnacle at 12 metres. We got a bottom time of about 37 minutes without getting into decompression. Our maximum depth was about 26 metres when we went into the cave. Most of the first 28 minutes of the dive was between 20 and 23 metres. 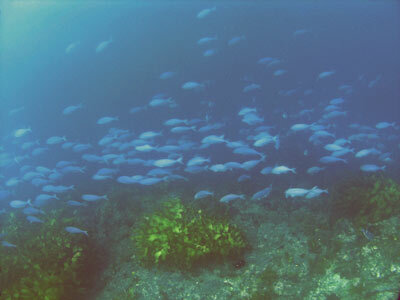 We had about 20 metre visibility, with a water temperature of 22° in March. An excellent dive. 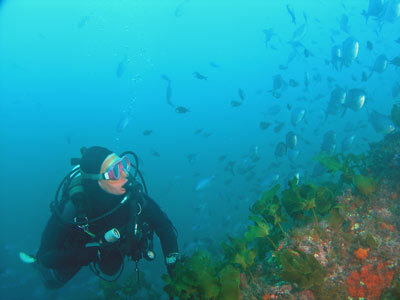 I dived with Northland Dive.